Today I will be taking part in the cathedral crib service which I must admit is one of my favourite services of the year! Over a thousand children and adults will pack the nave as we celebrate the birth of Christ together and the children will be dressed as shepherds, sheep, Angels, kings and of course the odd Darth Vader! It would be hard to put into words the amazing day I spent with the vineyard children’s leaders at their national conference near Northampton yesterday. I did 2 one hour sharing sessions. Session 1 What I have learned from the good times telling them lots of stories about my many years ministering to children. Session 2 what I have learned from the difficult times sharing about cancer and bereavement. The response to both was incredible. 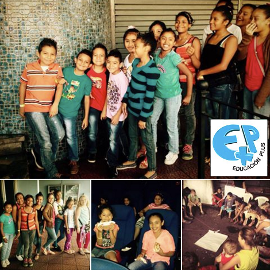 I have not been invited to speak to childrens leaders for years which made even more special. Thank you Dave (one of the organisers) for inviting me…and really honouring me in a way I’m sure I don’t deserve. I feel I still have so much experience to pass onto those ministering to children which would help them in their calling. As we drove home I called into Guildford hospital to visit my good golfing buddies 39 year old daughter who has just been diagnosed with AML leukaemia. 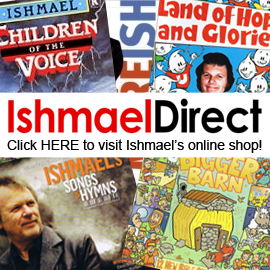 Just a reminder about our Christmas offer that if you order one or more CDs from our ishmaeldirect.com shop either CD or download, I will send you another CD that I think you will like for FREE. Also I still love listening to my last CD (well there are some great singers on it) ‘songs and hymns’ and think it would make a great Christmas present for someone. So if you order one of those I will not only send the free CD mentioned above but also a copy of our back catalogue Christmas Carol Celebration CD which still after 25 years rocks! Offer ends on Christmas Day. Well I’ve arrived home rather exhausted after an action packed house party weekend with St Martins church and what a weekend we had! The weekend included Great music worship, gentle quiet reflective times, a talent show, a barn dance, wonderful fellowship and also I did a spot of sharing and teaching. Oh yes and on a free Saturday afternoon had a few minutes to pop into the lovely Lichfield Cathedral. I can honestly say that I loved every minute of my time spent with these lovely people and having not done a house party for years…I’d forgotten how special they can be. They think it’s all over…but I’m hoping and praying that it isn’t! I enjoyed last night’s ‘Sting in the Tale’ concert in Felpham sooo much! And even better the 35 or so who attended really seemed to enjoy it as much as I did judging by their participation and encouraging comments afterwards. The evening has changed quite a lot from the first one I did 14 months ago. It now contains quite a few different songs and interesting stories and I’ve even included the original Glorie song and Father God I wonder. Now I feel that the set is well balanced and just how I feel it should be, fun and relaxed, yet gently saying things that God is using to speak to people. The other thing I’ve noticed is, that although I think all ages of adults would enjoy it, a large number that attend are older than me! But of course, this is the age group that remembers me best and lets face it, there are not many Christian evangelistic concerts nowadays that are put on in Churches where older folk feel comfortable attending and are encouraged to bring along their non-churched friends! So it’s filling an important gap.